By Miriam Rasch, 19/12/2017 at 3:19 pm . build a strong network of partners in which smaller collaborations can take place. First, the belief that solid ground for reflection on art and culture in both niche and mainstream media is absolutely necessary in sound democratic societies. Second, the urgent need to turn around the decline in in-depth reflection and critique, which has gradually been replaced in the media with human interest and public relations, partly due to severe budget cuts in the arts and culture sectors across Europe. Third, the aim to support criticism in national languages and directed at local cultures and art production. The project is invested in experiments in art criticism with the use of digital technology. Digital technology in some aspects has had detrimental effects on the practice of art criticism, such as loss of income through the spread of free journalism, a heavy Anglo-American overweight in the media industries, and a highly accelerated attention economy that doesn’t favor niche products or nuanced evaluation. How can the affordances of technologies that also can be identified – direct connections to the audience via social media, a higher diversity and inclusivity rate, new distribution and networking options, and experimental possibilities for form, content and revenue models – help reinvigorate and strengthen critical practices? One of the main conclusions to draw from the meeting is that the three aforementioned principles tie together in an increasingly polarized and politicized cultural context. There is a need for new ways to make use of technology to facilitate networks of critics, researchers and media, so as to work on the strengthening of critical thinking, writing and publishing. This has strong significance both with regards to the financial situation of critical media and the political dimensions that they operate in – two factors that are obviously closely intertwined. The consortium is developing along the lines of three different categories: making/practices, research, and (local/global) policy. The focus on experimental art criticism is present in all of these categories, either explicitly or implicitly. Partners may identify with one or more of these categories, as they are intertwined and overlapping. Writers, producers, publishers, curators, artists, and other practitioners in the cultural field who have an interest in experimenting with form and content, and revenue and distribution models. Critical media publications, whether on paper or online, and physical spaces for public events and exhibitions, are both outlets and platforms for the future of art criticism. We are on the look- out for interdisciplinary and cross-platform developments. Individual researchers and research institutions that investigate specific questions in the field of art criticism. Such questions can range from the interaction between critique and the changing political climate; the effects of the financial crisis and budget cuts for a culture of critique; the possibilities of new revenue models in the arts; the existence and/or development of diverse perspectives; new critical forms for contemporary art forms. polarization, and cultural spending? In short, what kind of political action is needed to support a viral culture for art criticism? The meeting focused on establishing an agenda of topics to investigate further in round table discussions. In small rotating groups five of these topics were talked about in detail, bringing experiences, difficulties, and best practices to the table. Below, we give a short round-up of each of the discussions. The other three topics (last in the following list) will be described in lesser detail. We see these topics as an agenda for the future of art criticism in general and take these points as a signpost for the continuation of our investigations. Three financial pathways can be identified: state funding, the free market, and private funding. Whereas for some it is obvious to use state funding, for others (for example from countries under heavy political tensions), using state money can mean compromising yourself to the level of propaganda. Operating in the free market seems to guarantee independence. However, the advertisement model for example, raises objections too, especially now that the advertisement landscape has shifted completely to Facebook and Google. A problem with funding agencies, whether state-based or private, is that they are focused less on cultural reflection. Innovation, interdisciplinarity and experiments are rarely promoted. Lobbying is needed to keep the relevance of criticism on the political, institutional, and media agenda. In the meanwhile, the precarious situation of critical media calls for a flexible and pragmatic approach. – Seek other kinds of funds, like for education or networking, and use them in a pragmatic way. – Experiment with (a combination of) business models such as donation, crowdfunding, online subscription models and keep your organisation flexible. – Be conscious and transparent about where your funding comes from (‘smelly ads’). – Invest in long-term lobbying. How can digital technology make criticism, critics and their surroundings – readers, writers, editors, translators, designers, and programmers – resilient? First of all, a critical stance towards technology itself is important. Who owns the tools, the data, and the content? And why would we use them, what are they inherently good for, how can they be truly relevant and not just a gimmick? How do we deal with automated recommendation, fake reviews, and fragmentation? The acceleration of technology, with its exclusive focus on newness, shouldn’t be meekly accepted, but challenged. We need to think through the options offered by technology on our own terms and be conscious and critical of our own strategies and practices. Examples of promising concepts are: newsletters, critical fiction, hybrid combination of live events with print and paper, sharing across borders, connecting art to the political present. – Critically re-evaluate older forms and strategies (such as the newsletter). – Challenge the pressure of newness and acceleration. – Seek out new forms and concepts that technology makes possible, with added inherent value. – Think about hybrid strategies where tools and concepts are combined. One of the affordances of digital technology is that it opens up the critical field to many different perspectives. How to stimulate a culture of critique with different voices? Not just when it comes to the writing critic – is it also possible to make the role of the public more prominent in criticism? And how is the quality of the content then kept in check? This does not have to be limited to individuals, but can also be conceived more broadly, as institutions, libraries, and schools or universities. Strong communities and physical events are necessary to provide collaboration with different audiences, with different types of knowledge, expertise and experiences. It calls for a local focus, of which the experiences can then be exchanged on a broader regional, national, or even international level. – Make use of the existing local infrastructure, such as public libraries, and combine online and offline ‘spaces’. – Think of empowering audiences; criticism can still be pedagogical, but it should be done in a horizontal way and not top-down. – Connect the professional critic and the ‘amateur’ critic and make use of the differences in knowledge, expertise, and experience. In the precarious state that many critical publications or organizations find themselves in, the need for creating sustainable networks is heartfelt, so as to collaborate among media, for example in distribution; to exchange experiences in workflows, methods, tools; and to set up new collaborations among critics, media, and countries. The question of the workflow is important: How to design and implement a workflow that enhances the quality of the publication. And how does technology help in this? How can we make a dialogical model? What is the desired speed of publishing in the digital age? How to retain quality in a sped-up digital environment? Who owns the data, tools, content, and can this be organized cooperatively? – Organize through for example a mailing list to exchange ideas and experiences. – Critically evaluate the role of technology in workflow and organization. – Make an effort towards cooperative models and methods when it comes to ownership. The political context in which art criticism operates is one of the most important topics to further investigate. Criticism operates simultaneously on a local level and on a global level. Critics work in their own environment, within the culture (and often language) of their own, while increasingly being embedded in a global media landscape. The locality of critique and its political significance on that level shouldn’t be denied or forgotten, while at the same time we can think of possibilities for a truly global critique: post-lingual, visual, and/or new ways of collaboration across borders. Such collaborations however oftentimes meet with bureaucratic obstacles and difficulties of cultural translation. – Make criticism relevant through connecting to local issues. – Show the multiplicity and heterogeneity of different localities. – Develop forms of global criticism. – Develop (international) collaborations between different media that operate locally. – Resist the dominance of the Anglo-American media production and support a strong critical culture in the local language and culture. The question how to find or expand audiences and paying publics is one that is always on the agenda for media publications and organizations. Many of the strategies named above can be seen in this light: the aim of experimenting and finding new ways of doing critique is always also meant to retain relevance for the public and develop a sustainable working practice. Some questions that can be investigated are whether new forms of criticism go hand in hand with new audiences (which might be more diverse or inclusive); how the hybrid strategies of combining print/online/events help grow an audience; and how new business models can be implemented. Another important topic for a sustainable critical domain is the education of the next generation of critics. How to work on the strengthening of critical thinking, writing, publishing, and the necessity of inclusive art criticism? Is there a generational gap between the older critic who doesn’t use new technologies and younger critics who do? How to keep the quality of criticism high in the transferral to new practices and workflows? How to organize the critical domain so it can also function as a breeding ground (and not just for precarity)? Editorial processes are woven through all the practices and topics described above. Developments in critical publishing practices can never be seen separately from the editorial work. Within the highly technological domain of publishing there is a need for new editorial processes that provide quality, flexibility, and efficiency. New formats and contents ask for new workflow design: for example, how to facilitate the move from a top-down or one-way mode of communicating to a more prominent role of reader contributions; how to deal with multiple voices and contributors and still maintain high quality critical reflection; how to incorporate collaboration and hybridity in the daily use of the workflow? – Short-term and ad hoc collaborations, meetings, and workshops between partners within the consortium, some of which are in the making. Don’t hesitate to contact us with ideas and plans! 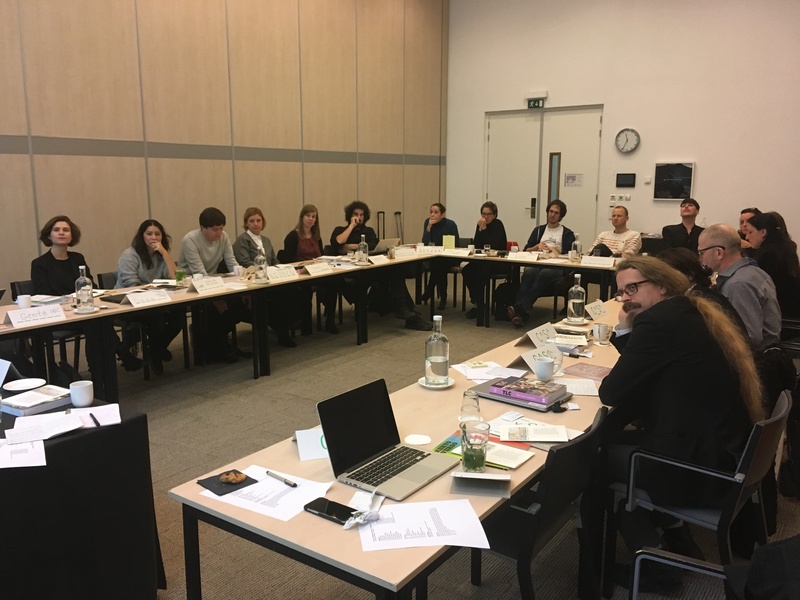 – Organizing a second meeting in 2018 and an international conference in 2019. – Ongoing literature research, best practice collection, etc. If you have tips, please contact us on the mailinglist. 19 September 2018 14:30 - 17:30 uur Hogeschool van Amsterdam In de workshop Podcast oefen je met eenvoudige opnametechniek, montage software en, misschien wel het belangrijkste: strategieën voor inhoudelijke en logistieke scenario’s.